Not only is Dr. Birth a leading orthodontist in the North Texas area, she is also a published author. 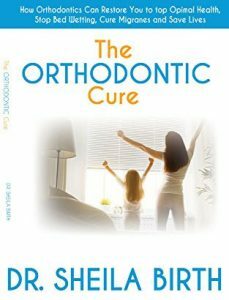 Dr. Birth’s book is titled “The Orthodontic Cure” and it was a best seller on Amazon the first week it went live. In this article, we will give you a brief overall view of the book, and then week by week we will look at each topic in more detail. Dr. Birth has been an Orthodontist for 31 years and has thoroughly enjoyed every day of her practice. Orthodontics can change your life! Orthodontics provide key pieces of the puzzle for total body health. What? Isn’t orthodontics just braces and straight teeth? Actually, Orthodontics is much more than straight teeth. Orthodontics is the only profession, medical or dental, that can change skeletal structure without surgery. Orthodontists can expand the upper palate and move the lower jaw forward with simple orthodontic appliances. When orthodontists do these skeletal changes, they also affect the airways. Orthodontists can improve airways and improve breathing. Breathing is everything. Breathing is life. Problems with breathing can lead to poor performance in school, at work and in athletics. Problems with breathing can lead to snoring and sleep apnea. Sleep apnea can be life threatening, as it affects sleep, cardiac function, blood pressure, mental function and much more. Your teeth are important for nutrition and communication (smiling is universal). If your teeth are out of alignment, it can lead to clenching and grinding, with the brain subconsciously trying to grind these teeth into position. Grinding and clenching affect the muscles, the muscles develop triggers or knots that lead to jaw pain, TMJ pain, muscle pain, and persistent headaches and migraines. I wrote this book so that patients can quit suffering. There are simple orthodontic solutions that do not involve drugs, injections or surgery. I want to get the word out to people that have been suffering for years, taking drugs that are masking the pain, but not curing it. I wrote this book in hopes that other orthodontists can appreciate what they can do to make their patients healthy. All orthodontists can use the many tools that they have to improve their patients’ lives.